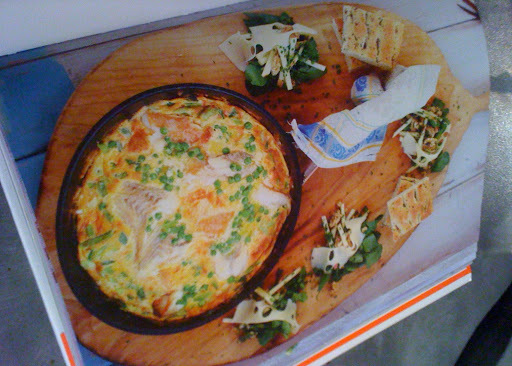 food / jamie Oliver. cooking / meals. 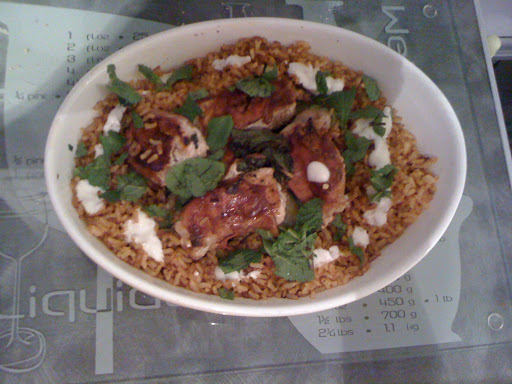 Jamie Oliver has become my cooking guru. His book 30 minute meals, in which he cooks three course meals in 30 minutes has become my bible, not that I ever succeeded in making them in 30 minutes. Usually they take me 45minutes for the three courses, but the recipes are good. Whatever food scientist put his recipes together deserve all the credit they can get. They have blended flavours together in a way that is delicious. Trouble is they are so good, I ate too much and I gained weight, so I have amended the recipes in 30 minute meals, less fat and half the quantity! He has now brought out a new book and TV series, “15 minute meals”. I couldn’t wait to try it. Quicker than a take away! This time he gives credit to the team of nutritionists that helped him headed by Laura Parr and has also calorie counted the food. There is noticeably less fat in the recipes, so I am probably not the only one who complained about gaining weight. There is also a veggie section which is very useful because I like to eat a high proportion of veggie meals, having been a veggie for many years. 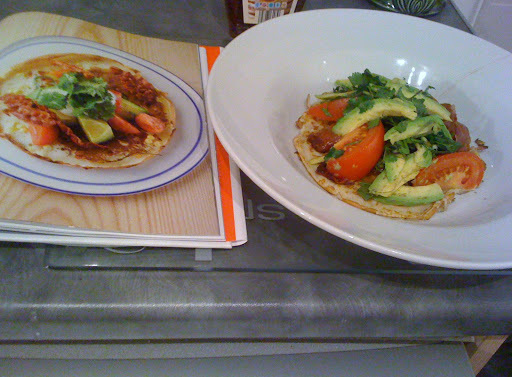 But can you really make them in 15 minutes?….well I had a try. All last week we dined Jamie style. Here is my effort, I used a salmon fillet I had in, instead of smoked haddock. 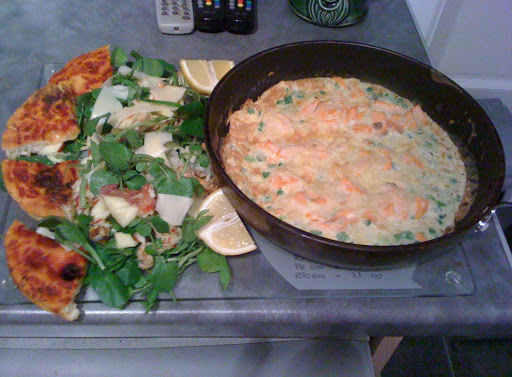 The whole dish was delicious and took 20 minutes. 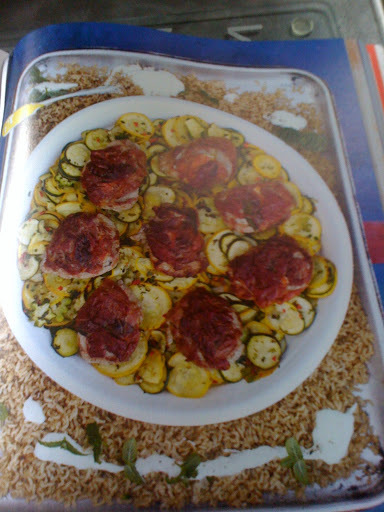 Jamies version, crispy parma pork with minted courgettes and brown rice. and my version, I pre cooked the rice the day before, instead of using bought stuff and there are courgettes there honest, underneath the pork. at this point I had abandoned Jamies “very important” recommendation to serve the meal on a board or platter. Much tidier on a plate… less washing up! Took 25 minutes, well worth the effort. 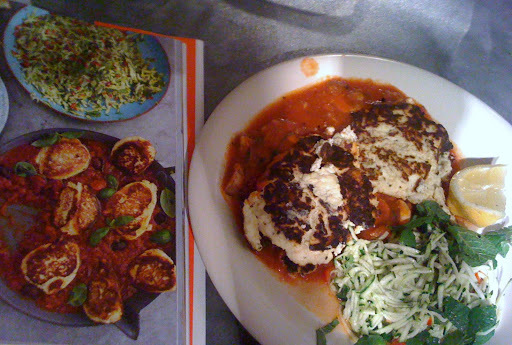 Below I have a picture of Jamie’s Ricotta fritters with tomatoe sauce and courgette salad….and my version at the side. Made in 15 minutes. Delicious. We also enjoyed Smokey maple pancetta, fluffy corn & chilli pancakes. I also made the “Mushroom soup with stilton, apple and walnut croutes“. Easy in 15 minutes. The “griddled tuna, kinda nicose salad”, took a little longer than 15 minutes because I don’t like my tuna pink. But of course it is not just about cooking in 15 minutes, for me the taste and blend of ingredients herbs and spices is the main thing and find I am cooking much more instinctively knowing what herbs go with what. For instance if I use a lot of chilli, somehow lemon juice balances the sharp heat and do you know that thyme goes well with mushrooms! There are at least 200 people who read this blog every day, I would love it if you said “hello”. Comments are welcome. Go to the home page and subscribe by clicking “followers” or “subscribe”from the pop out menu from the right hand margin and clicking “join this site” and use google, twitter or Yahoo, or another account you have to join and comment. Previous post ← THE CAPSULE WARDROBE. Thanks for posting the photos of your dishes next to Jamie's versions. You're descriptions of the meals and the ease with which you made them have convinced me to order this book from Amazon. Come to think of it, it would also make a good Christmas present for our children. Stephane made Jamie's mushroom risotto last week and it was out-of-this-world delicious…have you ever noticed that food always tastes better when someone prepares it for you? !